Guanajuato is a state of Mexico. The name means "Hill of frogs" that comes from the local indigenous language P’urhepecha. People who line in Guanajuato are nick named "Las ranas" which means "The frogs" The capital of Guanajuato is Guanajuato city. 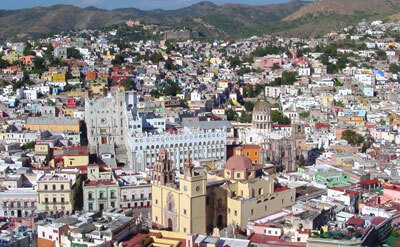 Guanajuato was one of the first areas on the entire Mexican state that was colonized by the Spaniards in 1520. This was due to the rich silver deposits and other minerals such as gold, tin, cooper, mercury, and opal that was found in abundance all over the state. Guanajuato was funded in 1554 and was given the city status in 1741. Land area: 30,768 square miles. Borders: Guanajuato borders the states of San Luis Potosí to the north, Querétaro to the east, Michoacán to the south and Jalisco to the west.